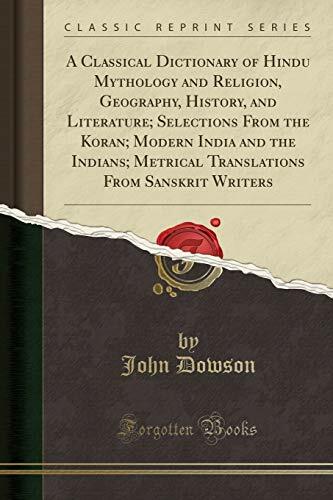 Excerpt from A Classical Dictionary of Hindu Mythology and Religion, Geography, History, and Literature; Selections From the Koran; Modern India and the Indians; Metrical Translations From Sanskrit Writers<br /><br />I cannot plead the conventional excuse of the solicitation of unduly partial friends for the appearance of this volume; nor, on the other hand, can I be charged with a desire to rush into print, as all these Essays have been published long ago (some more than a quarter of a century), in the pages of an esteemed Periodical, with a much wider circulation than they are likely to attain in a collective form. Two of them have appeared in a French garb in Paris.<br /><br />About the Publisher<br /><br />Forgotten Books publishes hundreds of thousands of rare and classic books. Find more at www.forgottenbooks.com<br /><br />This book is a reproduction of an important historical work. Forgotten Books uses state-of-the-art technology to digitally reconstruct the work, preserving the original format whilst repairing imperfections present in the aged copy. In rare cases, an imperfection in the original, such as a blemish or missing page, may be replicated in our edition. We do, however, repair the vast majority of imperfections successfully; any imperfections that remain are intentionally left to preserve the state of such historical works.